Larger water outlets. We use 2 3/4’ as opposed to the standard 2 3/8’. This helps maximize water flow inside of your gutters. We believe that this is a huge benefit due to the extremely wet climate we live in, here in the Lower Mainland. Stainless steel exposed fasteners. Over time, standard zinc plated screws will oxidize, rust and create staining. Stainless steel is also stronger. We use TITEBOND WeatherMaster Metal Roof Sealant for all of our seams, connections and end caps when installing your new gutters. It is a Superior product but it’s also 100% environmentally friendly. That’s definitely a good thing with all that water flowing back into the storm drains. This product is so versatile and strong that they even use it in the aviation industry! We offer Drain Guard Boxes on all of our downspouts that lead from your gutters, down to your perimeter drainage. This gives the customer the ease and convenience of emptying out the drain box, from ground level, before it clogs up your perimeter drainage. We have already done many of these installs in the Maple Ridge and Port Coquitlam area and they are a huge success! 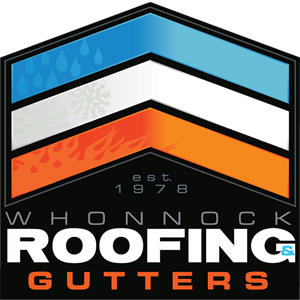 If you are looking for a great install for gutters in Maple Ridge, Port Coquitlam or anywhere else, please call 604-462-7638 to get your free quote today or email us at info@whonnockroofing.comThank you!! !